Why aren’t Hispanics protesting for Zimmerman like African Americans are for Trayvon? In a: news: cycle that has been transformed by 24-hour cable: news: and a social media into a pressure cooker perpetually boiling over, stories that would otherwise have only local repercussions can suddenly take on national importance when there’s a political agenda to be pushed. One might wonder then why the African American community has been so successful in politicizing these the racially charged Zimmerman trial, while the Hispanic community seems to be lagging in the defense of George Zimmerman, who self-describes as Hispanic. Partly this is because African Americans have a well developed practice of protest against perceived racist threats. Their community leaders mostly focus on supposed institutional racism and the media readily rewards those who push this victim mentality mindset, like Jesse Jackson and Al Sharpton. They are accepted by society and the media as “community leaders” regardless of whether or not: they actually represent the majority opinion: of the African American community. We simply don’t do racial outrage as well as the African American community does. One of the biggest reasons for this is that there is not as much homogeneity of identity among Hispanics as there is among African-Americans. Even the identifiers we use to sloppily patch together a greater ethnic identity are: artificial: – “Latino” and “Hispanic” don’t mean as much to us as our national origin. Mexican-Americans don’t mix well with Puerto Ricans, and differ from Cuban-Americans, who don’t understand Brazilian-Americans and Venezuelan-Americans. Whatever common “Latino” identity we can cobble together from our multitudinous backgrounds is fractured and tendentious when magnified. There are two paths given this divided identity as Americans — we either: embrace our common American dreams and aspirations, or band together in: a perceived racial grievance against America. : The former is encouraged by the conservative movement, and the latter is indoctrinated into us by the liberal media-education-entertainment industrial complex. For the most part, African-Americans have chosen through their elected representatives to reject America as racist and segregate themselves with a separate cultural identity within the country. This is why nearly 60% of African-Americans believe there is a lot of discrimination in America as opposed to 16% of whites and 22% of: Latinos. This hearkens to a deeper division between the African-American experience and the: Latino: experience, in that the specter of white guilt from America’s slave-owning past continues to cloud any real progress of the black community to accept its American identity. While some Hispanics cling to vague and theoretical notions that the Southwest was somehow stolen from Mexico, this isn’t nearly as: internalized into our common psyche: as slavery is in the minds of African-Americans. This explains why blacks seem to turn away from American culture while: Latinos: assimilate at greater rates the farther along they are from their first generation immigrant ancestors. Another reason for the disparate reactions from the black community and the Hispanic community is that there is a greater unity among African-Americans owing to a longer common experience of racism and exclusion. While they continually look back towards their involuntary introduction to American lands via slavery, Hispanics have a greater variety of introductory experiences to America. Some, like the Cubans, came as political refugees. Mexicans are mostly unwelcome economic refugees, while other families existed in American lands long before they were designated as a part of America. Southern Americans experience hostility from Mexicans while making their way to the United States. Puerto Ricans are granted legal status without question. There is simply not the uniformity of ethnic identity among Hispanics that there is among African-Americans. 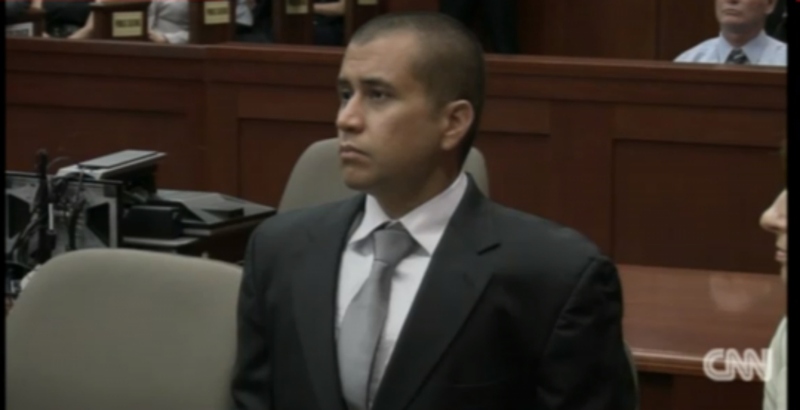 More concretely, the media immediately portrayed the Zimmerman trial as a minority versus white issue and placed Zimmerman squarely on the side of the gringo predators. They even went so far as to identify him by the rare and comical designation of “white Hispanic” in order to reinforce the race narrative. Since the various groups of the Hispanic community are susceptible to this worldview, the impetus among: Latinos: for defending Zimmerman was diffused early on. Lastly, let’s not ignore the 400 pound gorilla in the room — George Zimmerman has about as white a name as you can have, while Trayvon carried exactly the kind of urbanized name that is stereotypically expected of, and accepted in African-American culture. If only George had been known as “Jorge,” and had a more Spanish surname, he might have had more of a chance at protection from the: Latino: community. Thus the Zimmerman trial represents yet another stepping stone in the continued self-segregation and disassociation of the African-American community away from American culture, while it symbolizes to a lesser degree an opportunity for: Latinos: to reject identity politics. Rather than politicize the trial and elevate Zimmerman to sainthood status, we can see him as representative of: a different future for our community. : The Zimmermans retain a: Latino: identity in speaking Spanish fluently, and yet seek justice for George not as a member of a racial group, but as a citizen standing equally before the law, regardless of his skin color.